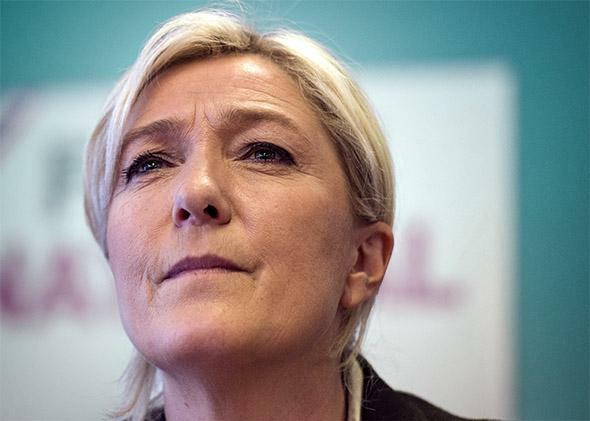 Ukraine, Marine Le Pen, and European parliament: European far right’s dangerous rise. Ukraine is desperate to escape what Europe’s far-right wants to become. French far-right party National Front President Marine Le Pen. Just as Ukraine wants in to Europe, Western European countries are wanting out. WARSAW—By any measure, it was a landmark, landslide victory—for Europe. On May 25, Petro Poroshenko declared victory in the first round of the Ukrainian presidential elections. He had won the support by more than 55 percent of Ukrainians—and they knew exactly what they were getting. Poroshenko campaigned on integrating his country into European institutions. After his victory, he repeated that goal. Ukraine is on the brink of financial catastrophe and is fighting a de facto invasion: Well-armed Chechen soldiers have now arrived to assist the Russian-made insurgency in the east. Yet in his victory speech, he declared he wanted not only to “put an end to war, to put an end to chaos” but to “bring in European values” to his country. Twenty-five years ago, on June 4, 1989, another election, this one in communist Poland, also turned out to be a landmark, landslide victory for Europe. Although some of the vote was rigged, every single openly contested parliamentary seat was won by a candidate from the democratic opposition. The party’s last pretense at legitimacy crumbled; Poland’s first noncommunist government since World War II came to power. Also facing financial catastrophe—though fortunately not invasion—Poles then were motivated by the same things as Ukrainians now. In 1989, if you asked anyone in Warsaw what kind of a country they wanted, the answer was always the same: “normal.” And “normal” meant Europe. Poles wanted European democracy, European capitalism and, eventually, European prosperity. They did not seek alternate models, or to try to create a “third way” between East and West. They did not want to become Ukraine, floating abstractly in post-Soviet geopolitical space. They wanted to look like Britain, France, or Germany. A quarter-century later, they almost do. Neither Poland nor any of the other post-communist nations are remotely as wealthy as their western neighbors—it may take many more decades to eradicate a generation’s worth of communist misrule—but they have comparable political systems, similar economies, identical border guarantees. By any measure, all of them are more prosperous now than they were in 1989. Indeed, on the same day that Ukrainians voted for “European values”—and almost exactly a quarter-century after the Poles voted for “European values”—another landmark, landslide election propelled an unusually virulent group of anti-Europeans into prominence. Millions of Frenchmen voted the National Front, an anti-European party with anti-Semitic roots, to the top of France’s European parliamentary election list. A few days earlier, millions of British voters also opted for the U.K. Independence Party, another anti-European organization composed of a charismatic leader, Nigel Farage, and a strange coalition of cranks, cheats, and open racists. Dutch, Danish, Italian, Austrian, and Hungarian voters sent similarly inclined candidates to the European Parliament, so much so that they may be able to form a full-fledged far-right voting block. Not only do the leaders of these two parties reject “European values,” they have gone out of their way to declare their solidarity with a man who symbolizes everything that Poles and Ukrainians have been trying to escape. During a trip to Moscow, Marine Le Pen, the leader of the National Front, declared her admiration for President Vladimir Putin’s “patriotism.” UKIP’s Farage has also named Putin as the world leader he “most admires.” They aren’t alone in admiring the Russian “model”—corruption, media manipulation, disregard for borders, and the rule of law, all included. What Ukraine is desperate to escape, in other words, Europe’s far-right is now desperate to become. But there may be a deeper explanation as well. Those who don’t have democracy, stability, or “European values” want them desperately. And those who have them don’t appreciate them—and perhaps cannot. John Adams once wrote that “there never was a democracy yet that did not commit suicide,” and we could be closer to watching this happen than we usually think. Some Europeans are already reaching for the arsenic. The question now is whether the rest can prevent them from swallowing a lethal dose.